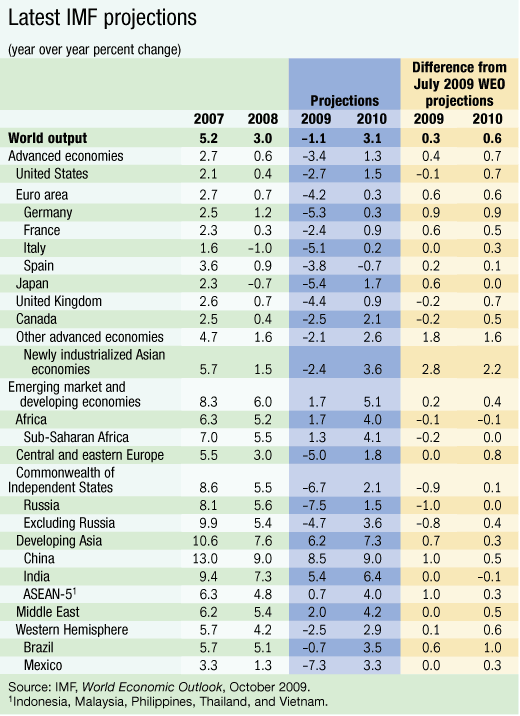 After contracting by about 1.1% in 2009, global activity according to IMF’s latest report on the global economy, is forecast to expand by 3.1% in 2010. This is is more optimistic than the last update in July when the Fund projected the world economy would shrink 1.4% in 2009. The new forecast, in terms of higher annual average growth rate for 2010, largely reflects carryover from a markup in growth during the final half of 2009. Blanchard however, noted that “the current numbers should not fool governments into thinking that the crisis is over.” He urged countries around the world to coordinate policies to achieve a global rebalancing and sustain the recovery. As the table below shows, EMs and developing economies are clearly front runners in the recovery, expanding by 1.5% this fiscal year before rebounding 5% next year led by China and India which are expected to grow at 9.0% from a July estimate of 8.5%, and 6.4% from 5.4%, respectively. In Japan the economy is expected to recover by 1.7% next year. The US growth forecast is at 1.5%.